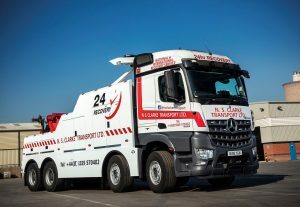 Staffordshire’s NS Clarke Transport vehicle recovery arm is going from strength to strength and is now running seven specially equipped trucks representing an investment of nearly £2m, from headquarters in Rugeley to which it moved a couple of years ago. Four are based on Mercedes chassis supplied by Midlands Truck & Van. The latest is a 26-tonne 2532 Actros with StreamSpace cab. A low frame height model, it is powered by a 320hp straight-six engine. As with all of NS Clarke’s recovery equipment, the Actros was bodied by Boniface Engineering, of Thetford, Norfolk. Its Chevron tilt and slide bed has a 13.6-tonne capacity, while a Hyva HC 241 X crane, which works with a damage-free lifting frame, is capable of picking up a family saloon weighing 1.6 tonnes at a distance of 12 metres, and a vehicle weighing 8.6 tonnes from a position alongside the truck. The flagship of the fleet is an Arocs 4153 eight-wheeler with three-stage heavy-duty Recoverer Trident recovery boom, which is assigned to jobs involving large trucks, buses and coaches. The two remaining Mercedes recovery trucks are both 15-tonne Atego 1521s. They have ClassicSpace cabs with optional bench seats for up to four passengers, and tilt and slide bodies. All six of NS Clarke’s breakdown vans – four Sprinters and a couple of smaller Vito models – are Mercs. The operator is investing, too, in its haulage fleet, and has just taken delivery of another 10 Actros 2551 BigSpace tractor units, its first with intelligent Mercedes Uptime connectivity.